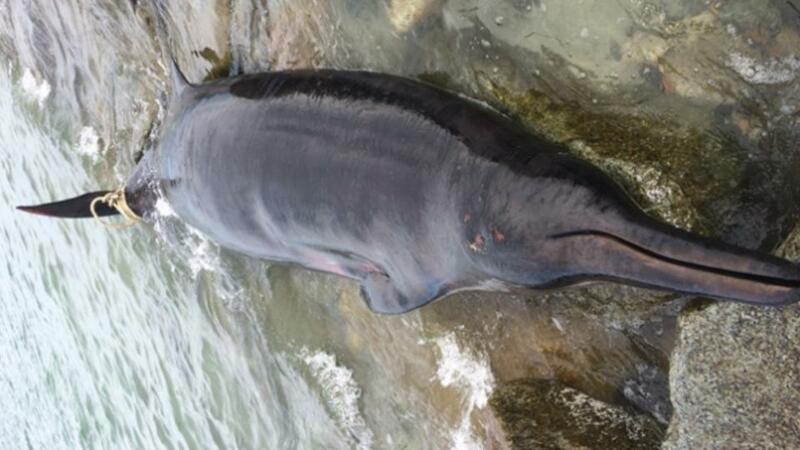 Plymouth – Biologists are currently analyzing the carcass of a rare deep-sea beaked whale that beached on a Plymouth, Massachusetts, shore. The event, although tragic, is a good opportunity for experts on the matter to deeply study the unfamiliar mammal. The whale found on a Plymouth beach laying on the rocks, is so strange for biologists that its appearance has raised two main questions: in what species does it belong? And, why did it reach shore? The 17-foot toothed female whale, weighs almost 1 ton. It has a long slim snout and dark purplish skin. It resembles a dolphin, although bigger, researchers explained. “They are so rarely seen that New England Aquarium biologists have been conferring to determine the exact species, which they believe to be a Sowerby’s beaked whale. Aquarium staff last handled a beaked whale in 2006 in Duxbury,” the New England Aquarium staff said. Moreover, Sowerby whales are usually found hundred of miles away from shore, so it is uncommon to find this type of mammal on the beach. They spend most of their lifetime in deep water, so little is known about them. They are specialized in diving great depths, and stay submerged for long periods. There are still no signs of what may have caused the death of the animal, as well as why the whale reached shore. Further investigations will take place within the next few days. To remove the whale from shore, and transport it to the laboratory, Plymouth natural resource officers had to anchor it and wait for high tides in order to easily remove the massive animal from the rocks.